Documents to Go for Android Launched | Android Blast! Anyone who has been using PDAs and smartphones for any length of time is familiar with Documents To Go. You know the software that allows you to open Microsoft Office files on your mobile? 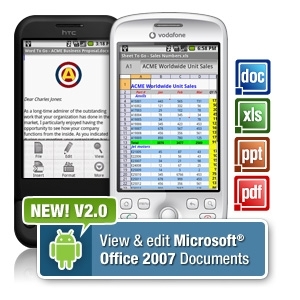 DataViz announced that the company is now shipping Documents To Go® 2.0 for Android™. The new version of the popular office suite leverages DataViz’s experience developing mobile solutions and brings a feature rich, enterprise-grade productivity tool to devices based on the Android platform.